Do you have any questions? Comments? Send us a message. We will get back to you quickly. Art Systems launches a new website! 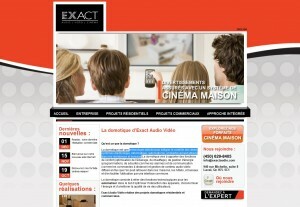 Art Systems is proud to announce the launch of a brand new website for Exact Audio Video! Speclialized in home automation, this Quebec company provides technologies that allow the control of various electronic devices, computers and entertainment systems. With a News section and a portfolio, this new site will help our client attract new customers through the web! Aimez et partagez ! Like & Share! Art Systems programmed a new site for engineering firm MLC Associés inc.! 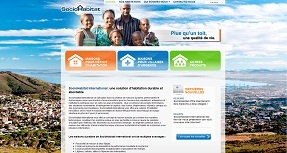 Art Systems created SocioHabitat International's very fist website! The site has three different backgrounds that illustrate the multiple uses of SocioHabitat homes. Have a look! A small team and a real dedication to every client make all of Art Systems' projects a success! Always in search of renewal, Art Systems is on the lookout for trends, and is full of ideas! With nearly 15 years of experience in Web technologies, Art Systems is a winning choice! Our project managers, rigorous and attentive to detail, are always looking for solutions that benefit their customers! Copyright © 1999 - 2017 Art Systèmes Canada Inc - Tous droits réservés - Services informatiques Art Systems Canada Inc.